There are many ways to look at market technicals; one way is by looking at the internals. To do this, we like to look at the advance/decline line. This measures how many stocks are advancing versus declining on a various index. If more stocks are advancing, that is a sign of underlying strength. The flip side is, if many stocks are declining and the overall index hasn’t yet broken lower, it is a warning sign something could be wrong. Turning to the NYSE cumulative advance/decline line, it recently broke above a trend line going back nearly 10 months. This could be viewed as a positive development under the surface. The S&P 500 cumulative advance/decline line made a new all-time high last week. Considering the S&P 500 is about 4% away from an all-time high and the advance/decline line is already at a new high, this is another positive development of potential strength under the surface. Remember though, this doesn’t mean there can’t or won’t be a pullback, but it does suggest that any pullbacks could be a potential buying opportunity as the underlying components are strong overall. 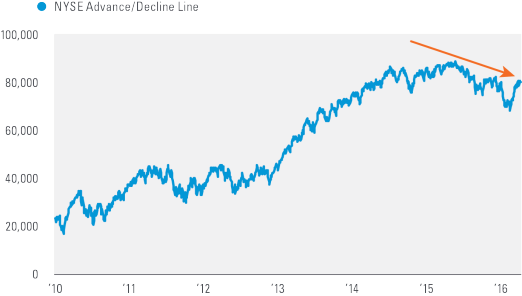 We asked David Tonaszuck, CMT, for his thoughts on the S&P 500 cumulative advance/decline line. Here is what he had to say. 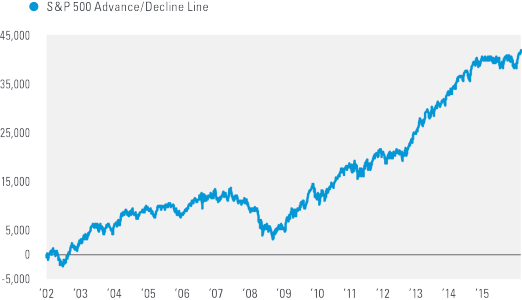 In conclusion, we like large caps (which compose the S&P 500), and seeing the strength in the S&P 500 cumulative advance/decline line indicates this group should continue to potentially outperform.